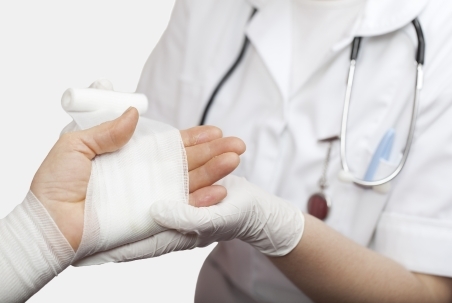 See the burn first aid page for what to do as soon as someone is burned. Use non-stick dressings against the burn to keep your wound moist and clean. If a burn dries out and forms a scab, it takes longer to heal. Ask your nurse if you're not sure what type of dressing to use, how often to change it or whether you can get your dressing wet. If any of these happen, see your doctor or nurse as soon as possible. If the burned person is feeling unwell, seek medical help urgently. Don't burst your blisters. This can increase infections. Your nurse will check any blisters and decide if they need to be burst. Keep the burned area raised (elevated). This can reduce swelling and help pain and healing. Read what else you can do to help your wound heal. With a burn it's especially important to drink plenty of fluids and to eat well with enough proteins and nutrients in your diet. You can take regular paracetamol (Panadol). Check the packet, and talk to your doctor, pharmacist or nurse, to see if it's OK to take ibuprofen (Nurofen). If you need stronger pain relief talk to your doctor. ACC covers most burn injuries. Your doctor or registered ACC provider can fill out a burn claim form for you. It's very important that you keep any follow-up appointments with your nurse or doctor, as burns can get worse over time. Find out who you should contact for advice between appointments. When you attend your appointment for a burn dressing change, take pain relief medication prior to the appointment (even if your burn is not currently painful). This is especially important for children. At first, your scar will be very fragile and can easily be damaged if you knock or bump it. Tell your nurse if you're worried about this. They can advise you on how to protect your wound, or refer you to the Scar Management Specialist Service for protective garments. Your scar will also be very sensitive to the sun for at least a year. You need to cover it with a sunscreen of at least 30SPF, or with UV-proof clothing. You will need to moisturise the skin at least twice a day to stop it from becoming dry and itchy. If the scar feels like it's becoming dry, tight or itchy, moisturise it again. Use any non-perfumed moisturiser that you know you're not sensitive to. It doesn't need to be an expensive product. If your scar continues itching, tell your GP. You can swim once your wounds have completely healed. Protect your wound from the sun if swimming outside. Once you've finished swimming, rinse off any chlorinated or salty water and thoroughly moisturise your skin again.